Most inbound marketers understand that business blogging is a critical part of a comprehensive inbound marketing strategy. 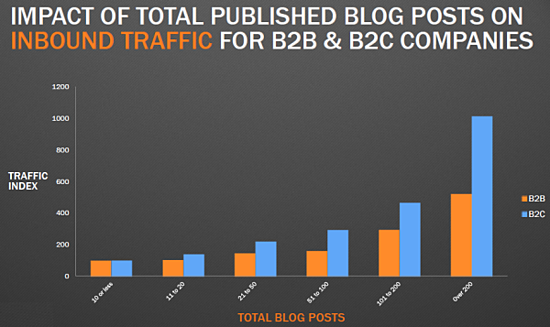 But how frequently does a blogger need to publish content in order to make a true dent in their marketing results? Furthermore, how does that vary between B2B and B2C companies, and smaller and larger businesses? 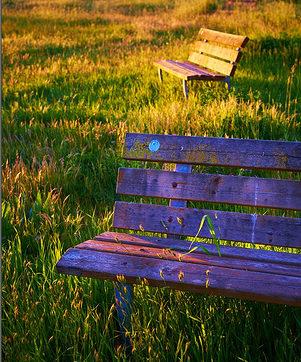 Wouldn't it be great to have some blogging benchmarks to go by? You're in luck, my friend, considering HubSpot just released its Marketing Benchmarks From 7,000 Businesses report, which provides helpful benchmarking data gathered from HubSpot's more than 7,000 customers who do inbound marketing every day. In this post, we've pulled 12 charts and graphs that highlight some valuable blogging benchmarks to help you get on the right track with your business blogging efforts. For higher quality versions of the following charts -- in addition to even more data about the traffic/leads ROI of marketing assets like landing pages and social media -- download our free report, Marketing Benchmarks From 7,000 Businesses. 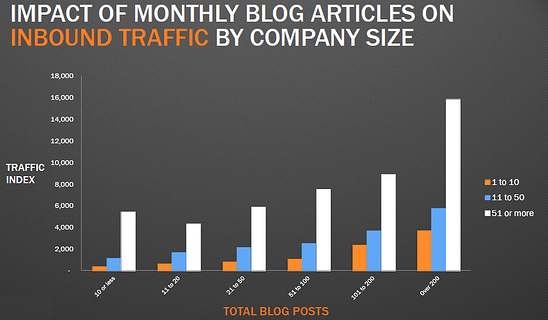 The first of our blogging benchmarking charts highlight the impact that the number of monthly blog articles a business publishes has on inbound traffic -- overall, divided up by B2B and B2C companies, and split up by company size. 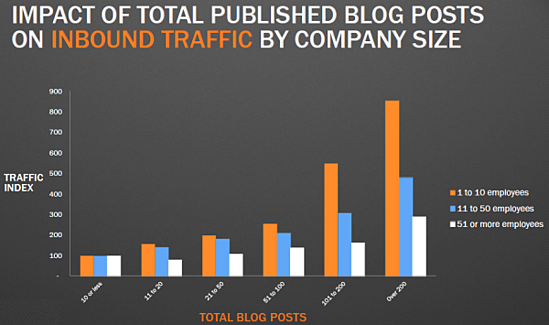 After seeing these charts, you've probably never been more convinced that when it comes to the effectiveness of blogging in driving traffic to your website, frequency matters. In fact, according to the charts above, companies that blog 15 or more times per month get 5X more traffic than companies that don't blog at all. And if you're a small business, increasing your blogging frequency can move the needle even more. According to the third chart, small businesses (1-10 employees) tend to see the biggest gains in traffic when they publish more articles. Make a commitment to regularly publishing content to your blog to reap the biggest rewards in terms of website traffic. To learn more about how you can boost your blogging frequency by never running out of blogging ideas again, check out this blog article. 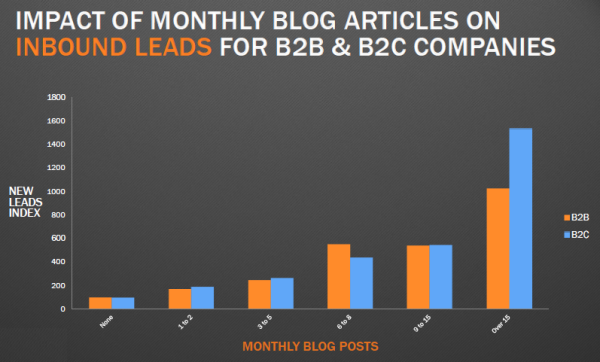 The following three charts feature the impact that the number of monthly blog articles a business publishes has on inbound leads -- overall, divided up by B2B and B2C companies, and segmented by company size. As you can see, blogging frequency matters not just in terms of the impact blogging has on driving traffic to your website. 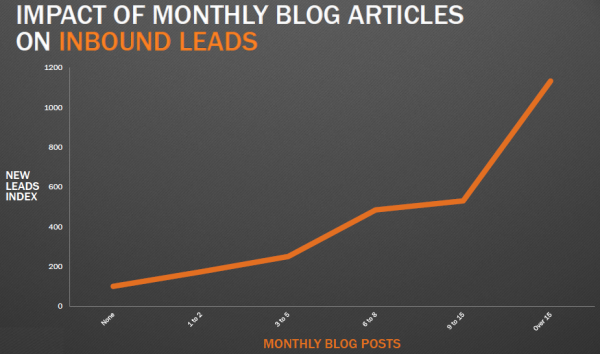 It's also critical when it comes down to the effectiveness of blogging in generating actual leads. 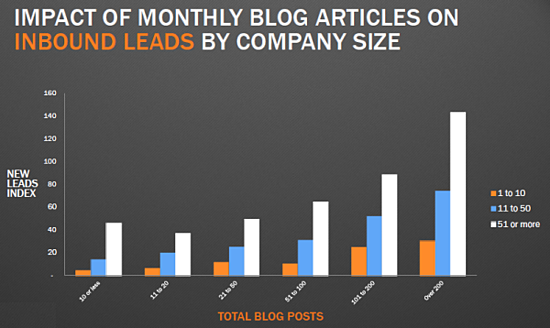 In fact, companies that increase blogging from 3-5X/month to 6-8X/month almost double their leads. And if you still need to be convinced that you should start a business blog to begin with, keep in mind that B2B companies that blog only 1-2X/month generate 70% more leads than those that don't blog at all. In other words, blogging even just a little bit can make a big dent on your leads goal if you previously weren't blogging at all. To get the maximum amount of leads from your blogging efforts, check out our ultimate guide to mastering blogging lead generation. 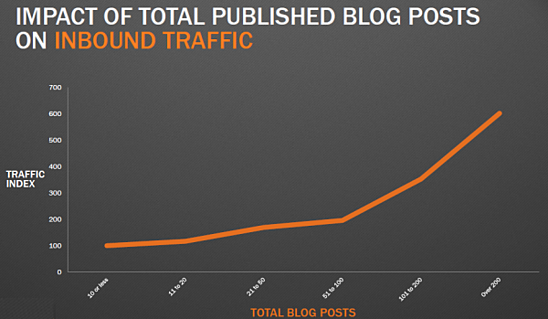 Our next three charts emphasize the overall impact of blogging on inbound traffic. In other words, how does the total number of blog posts you've published to your business blog -- past and present -- affect traffic? Remember, because the articles you publish get indexed in search engines and shared through channels like social media, the impact your business blog has on traffic isn't just limited to the articles you publish this month. By committing to regularly publishing blog content, over time you'll have built up a powerful arsenal of content, with each article you publish creating another inroad to your website. Not convinced? As indicated by the charts above, an average company will see a 45% growth in traffic when increasing total blog articles from 11-20 to 21-50 articles. 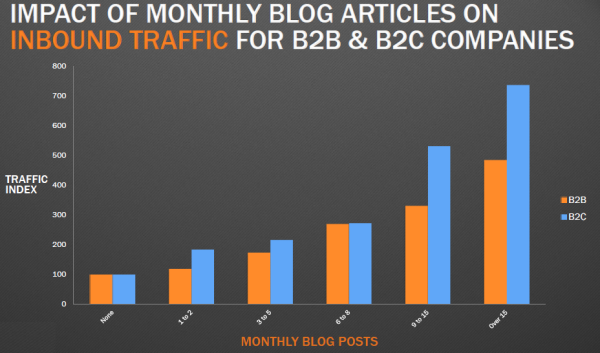 And for all you B2C companies out there, keep in mind that B2C companies see a 59% increase in traffic after growing total blog articles from 100 to 200 total. Sure, blogging is a big time commitment, but sticking to it can generate tremendously valuable marketing results. 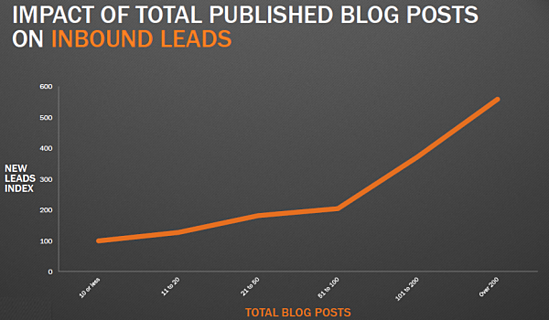 The last of our blogging benchmarking charts show the overall impact of blogging on inbound leads. That is to say, how does the total number of blog posts you've published to your business blog -- past and present -- affect lead generation? 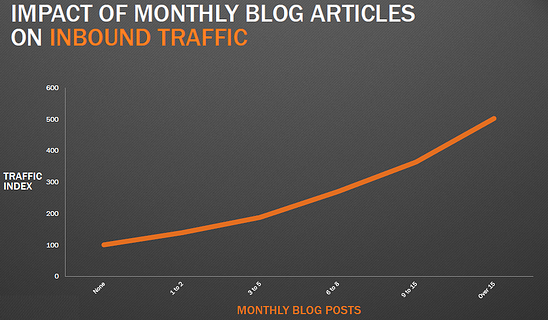 In a nutshell, making your blog a long-term asset by publishing a lot of content over time makes a big difference. This is evidenced by the fact that the average company with 100 or more total blog articles is more likely to experience continued lead growth, and even more compelling -- companies with over 200 blog articles generate >5X the leads than those with 10 or fewer. 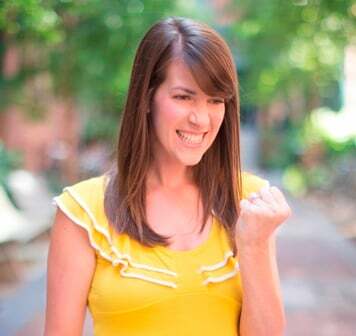 Are you making a big enough commitment to blogging regularly? To get more helpful benchmarking data about the effect of marketing assets like landing pages and social media on traffic and lead generation, download your copy of our free benchmarking report here.